I finally have what I think is the holy grail of drafting pencils. 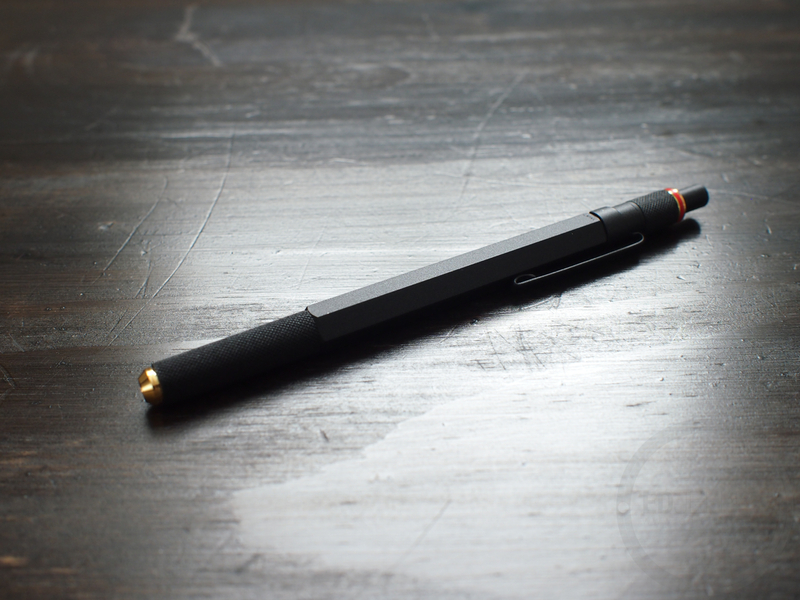 The all metal, retractable tipped Rotring 800 both looks and feels awesome. This is the first pencil that has made me feel like I’ve been missing out on something all along. Huge thanks to my friends over at JetPens for sending over the pencil and lead for review! Check out JetPens for tons of awesome Japanese pens and stationery. Free shipping on orders over $25, and hitting that is pretty easy with all the great stuff they have. So thanks again! 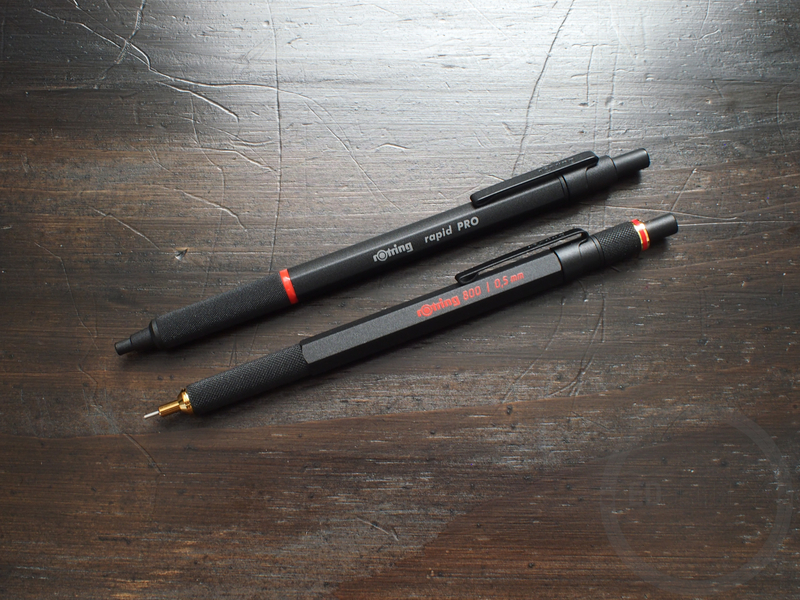 The Rotring 800 pencil is at the top of the line of drafting pencils from Rotring, and you can really tell. The 800 could be easily confused for the 600 from afar, but the retractable tip and the gold accents set the pencil apart from the pack. The accents give some added flair and reassure the user that the 800 is at the top of the line. 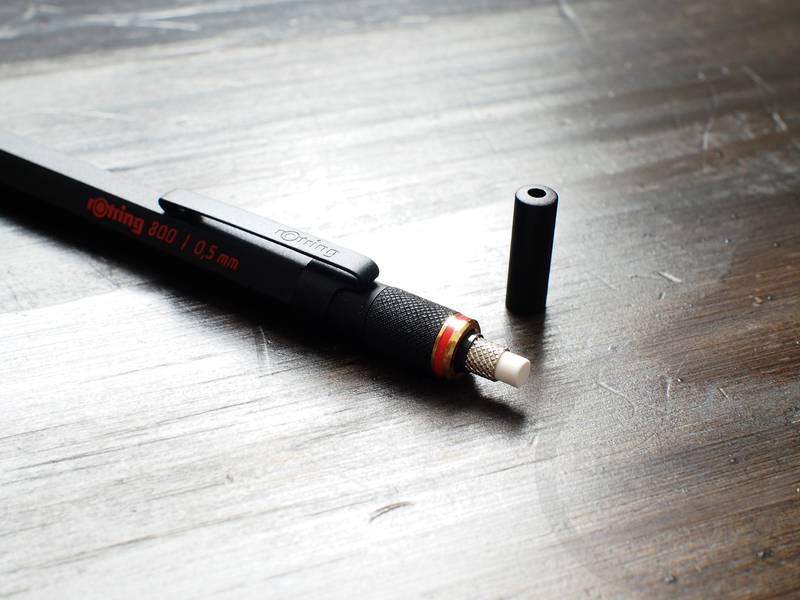 The 800 looks nearly identical to the Rotring Rapid Pro ballpoint, but the angles are a bit sharper and more pronounced. That doesn’t mean that they’re sharp or uncomfortable though. There is knurling on both the grip and the lead tube extension knob. 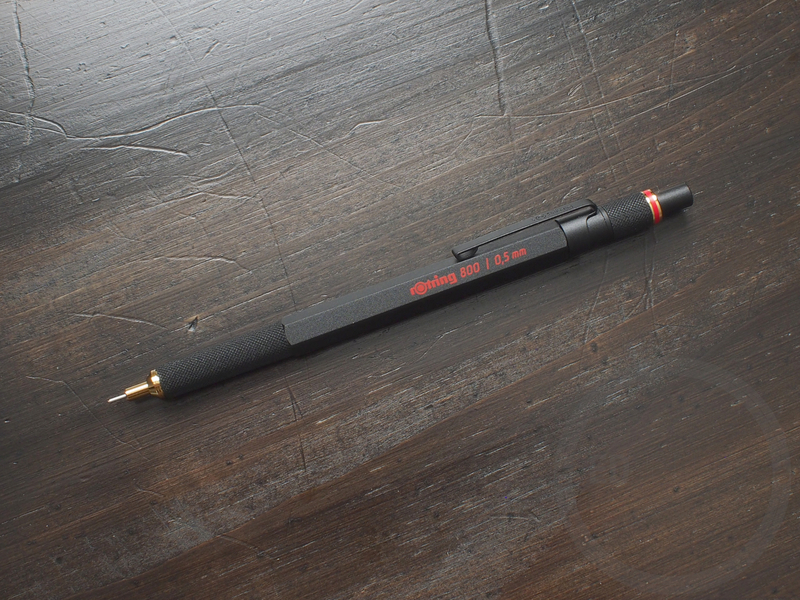 The entire pencil is matte black with glossy red logos. I really like the subtle glossy black “Made in Japan” logo on the back of the pencil’s body. It’s an awesome looking pencil, and it’s definitely my new favorite. 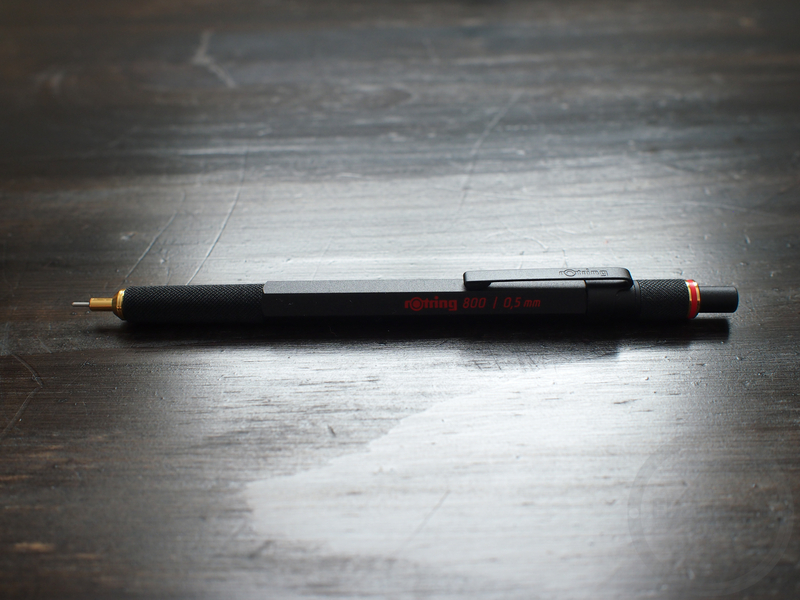 The Rotring 800 is the most expensive pencil from Rotring ($52.00) and it definitely feels that way. The 800 is all metal and feels as solid as a pencil can be. The 800 is a great weight – not too heavy, but with a nice amount of heft. The balance of the pencil is great, and it’s not weighted too much towards the front or back. While writing, the 800 felt very neutrally balanced. This is thanks to the all metal body, whereas in something like the Pentel Graph Gear 500, the weight is more towards the front. I wrote the entire handwritten portion of the review straight through with little to no hand fatigue. The knurled grip is grippy, but not sharp. The same can be said for the hexagonal barrel – it’s nice and angular, but never digs into your hand. The top has no discernible wiggle, which can be a problem with other retractable tip pencils. Overall, I’m very happy with the quality construction and feel of the 800. It’s definitely doing a great job as the flagship model. Upon opening up the 800, I ditched the included HB lead and loaded up some Pentel AIN 2B lead that JetPens threw in the package. The 2B lead is a bit softer than the HB, which results in a darker line on the page. Here’s a post about lead hardness scale with pictures showing the differences, I found it hugely helpful. The tip of the pencil has no wiggle to be reported, which is great for a retractable tip pencil. I did have one issue though, and I’m not sure if it’s due to the softer lead, or the internal lead advancement mechanism. The lead seems to break inside the pencil, right at the point where the mechanism grips the lead. Sometimes when you press the knock to advance some more lead, a small amount of lead either falls out, or goes limp until the lead behind it catches. After doing some research on the issue, it appears that I’m not alone. This can be pretty frustrating when you’re trying to write for extended periods of time and the lead either pushes back into the body, or doesn’t extend when you want it to. I’m going to give some harder lead a try, as it may be that the softer lead is breaking more easily. Other than this, I’m very happy with everything about the pencil. UPDATE: I swapped the lead out from 2B to a harder HB lead. There’s no more breaking, and it was as I suspected. The pencil writes just as nicely with the HB lead. Also worth pointing out, JetPens customer service reached out after seeing the review and said to send it back and they’d swap it out no problem! 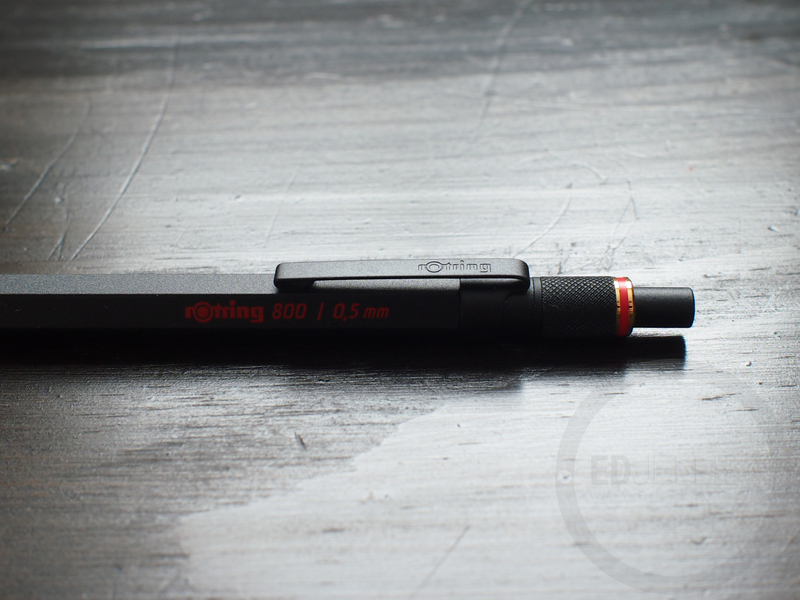 For a flagship model, the Rotring 800 should be perfect, and it’s so, so close. Looks, feel, and construction are all top-notch. The 2B lead from Pentel is smooth and dark, but I’m going to swap it out for a harder lead to see if it remedies the breakage problem (it did!). Other reviews of the pencil are great, so I suspect that I may have a fluke, or it’s the lead. That issue aside, it’s an awesome writing instrument and looks great alongside my Rapid Pro ballpoint. Thanks again to JetPens for sending this over to review, check out their site for more info on the pencil! Disclaimer: This pencil was provided to me as a review unit, free of charge, by JetPens. I was not compensated for this review, and this did not have any effect on my thoughts and opinions about the pen. Thank you for reading! Let us know how HB holds up in the 800. Great review, Ed. The 800 is a beauty for sure and definitely feels like it is worth $52. I have some 2B (or even 3B I think too) that I can run through mine to see if anything happens; maybe just a fluke like you said. Awesome shots as always. Thanks! I’m going to try out some other lead, and if it doesn’t resolve the problem, I’ll have to look into returning it. I think you should send your 800 back as defective. I use 2B lead in mine all the time and don’t have that issue. I know I strangulated my writing instruments when I write but, I don’t think I push down hard. It wasn’t from pushing down hard, that’s the weird part. It was the internal lead advancement mechanism gripping the lead too hard. I could be pushing with a light touch, and lead would still internally snap. If you look at the picture under where I describe it, you can see that it’s breaking well before it ever leaves the pencil. Thanks for the insight! I hope you get to try out a non-breaking 800 in the future. It is a very comfortable pencil to use for long periods of time. Have you thought about trying the Pilot Automatic? I would like to try one out but am without employment, presently, so I can’t justify that kind of expenditure at this time. Maybe you could request the Automatic for a review, even. I am going to feel like a poor researcher if you already reviewed it. I put some harder lead in it (HB) and the problem has disappeared.I have yet to try that one, but I think my threshold for pencils is almost to the top. 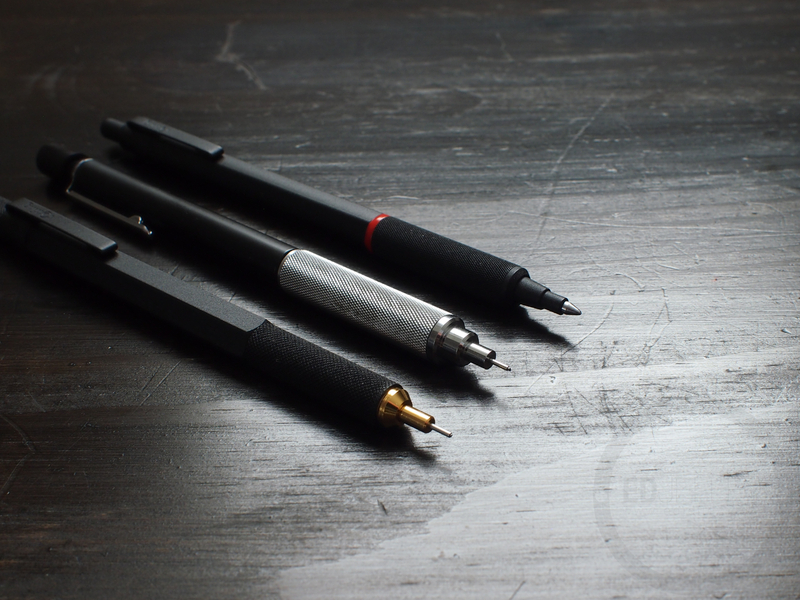 With the small amount that I use them, I think the Rotring 800 is way more than sufficient. This may sound odd, but I think there may actually be a “break-in” period on the mechanism in this pencil. I’ve been running 2B lead in mine and for awhile I was having the exact same breakage problem as you. What was really weird is I could advance a lead completely through the pencil with no breakage at all, but when I would actually write is when it would break inside the pencil where the collet grips the lead. What’s interesting is that suddenly I’m no longer breaking leads. No change in lead brand or hardness (2B Foray brand provided at work). I’ve probably burned through 15 or 20 leads total at this point and the last 3 or 4 leads have been perfect with no breakage. Interesting! Maybe it has to do with the internal spring breaking in and losing some tension? I’ll have to give it some more usage and see if it improves. Update! I found after a short while I was breaking leads again. So I tried a number of lead grades and eventually found that the softest I can use is F. Anything softer just breaks constantly. There is a very simple procedure to stop the lead breaking. It involves a slight tightening of a component. The component is shown in your photograph of the disassembled tip. What you need to do is tighten the gold sleeve that covers the clutch which advances the lead. Be careful not to overtighten! I forgot to mention that I own the silver edition of the Rotring 800 for 1.5 years, and it has performed absolutely flawlessly after tightening that component I mentioned. After 4 leads, it started breaking them from any sort of pressure applied during writing (only). Upon disassembly, I noticed that sleeve was ever-so-slightly loose. 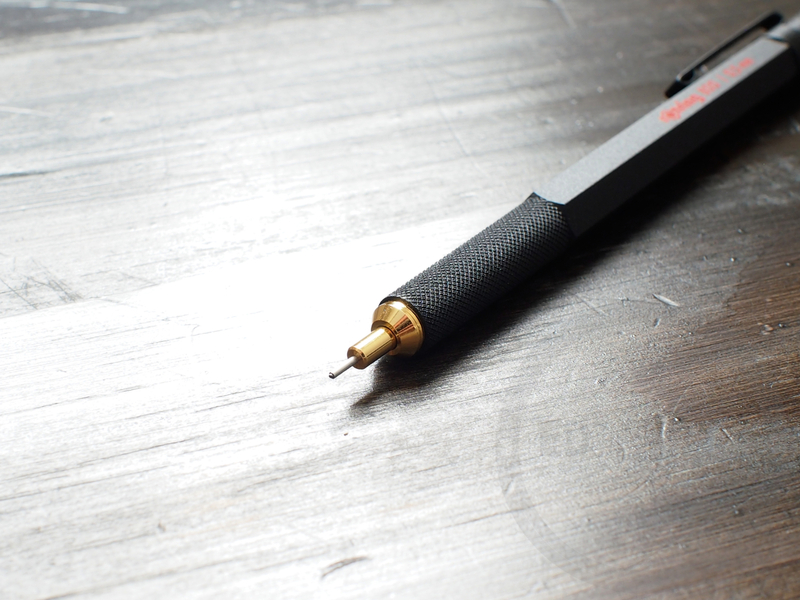 Easy fix, and ever since has not broken a lead again, using Uniball and Pentel HB leads. Wow, thanks for the tip! I’m definitely going to try that as well. I’ll update the review after I see how it works out for me. I have the 800+ and have also been struggling with the lead breakage problem. I found a review on youtube where the author suggested wrapping a single piece of tape around the nib to act as a shim which tightens the nib in the hole where it protrudes from the body. There is a small amount of clearance there which he felt, was contributing to the breakage problem. I’m in the process of trying that option. Not sure if it has helped yet. Interesting! I actually switched leads, and I haven’t been experiencing nearly as much breakage. I also tightened up the lead sleeve as mentioned in a comment above. Both seemed to have helped. I’ve tried changing the leads to no avail. I have also tried the “tape on nib” shim fix but it doesn’t seem to help either. I did comment on the rOtring website and received an offer to return it to them for warrantee repair. I’ll send it off and see how that goes. They warned me that it will take a few weeks to turn it around. Well I sent my 800+ in for repair and they sent me back a new one with only a short description (defective mechanism) as the problem with my original. So far the new is working fine. I just received my Rotring 800 black 0.7 by post. It looks great, but I’m not sure if the press mechanism on my pencil works as it should. you can see the press mechanism is separated into two parts, half a press moves the pencil tip just a bit, and the second half press to extend the lead. It’s almost like a camera shutter. There is a definite “break” between the two half presses. Are your pencils the same, or is mine fawlty? What you’re describing sounds normal to me. It’s because of slop in the mechanism that retracts the tip. The first half press takes up the slack, as it were, and the second half press extends the lead. I agree this is not ideal.